As personal historians, Alison and I spend much of our time telling people they should write their life stories and teaching them how to do it. Our recent focus has been on coaching people to tell life stories in shorter segments or chapters as an alternative to a comprehensive autobiography. I have written some of my own life stories and even created a few family histories of my own but this year I decided to “step it up” a bit. I committed to create twelve chapters of my life in individual books this year—one each month. As we coach our clients to do, I have created a life timeline and used it to brainstorm my life experiences. This gave me a big picture view of my life and a lot of ideas to choose from. Using my timeline as a guide, I made a list of 15-20 possible short book ideas. Then I picked one to start on: my experiences as a teenager working on a ranch in Colorado. These ranch tales were not necessarily my most important or defining experiences, but they were an easy and fun place to start. I made a list of some of the stories I wanted to tell about working on the ranch and started to gather a few pictures. The Oral History Room at the Riverton Family History Library. I have interviewed hundreds of people; many of them on video. But this time I would be on the other side of the camera! Not far from my home is the Riverton Family History Library, which allows anyone to use their FREE facilities to record life stories. Their helpful and friendly staff set me up in the Oral History Room where they queued up the video recorder, gave me a water bottle and a few instructions, smiled, told me to have fun, and left the room. I had made few notes, but I pretty much set them aside and began to tell my experiences beginning with the summer after seventh grade. Before I knew it, the countdown timer showed that I had only a few minutes to wrap it up! I had talked for almost an hour, to myself (keeping my potential future audience—grandkids and beyond—in mind.) It was fun. I left with a video and oral history on a flash drive. A great start for my story! Last Christmas, after chowing down on some terrific sourdough biscuits, my brothers and I called our old ranch manager Wayne and his wife Carrie Lou to thank them for the recipe--and for tolerating the invading teenagers we had been 46 years earlier. They invited us to come for a visit sometime. 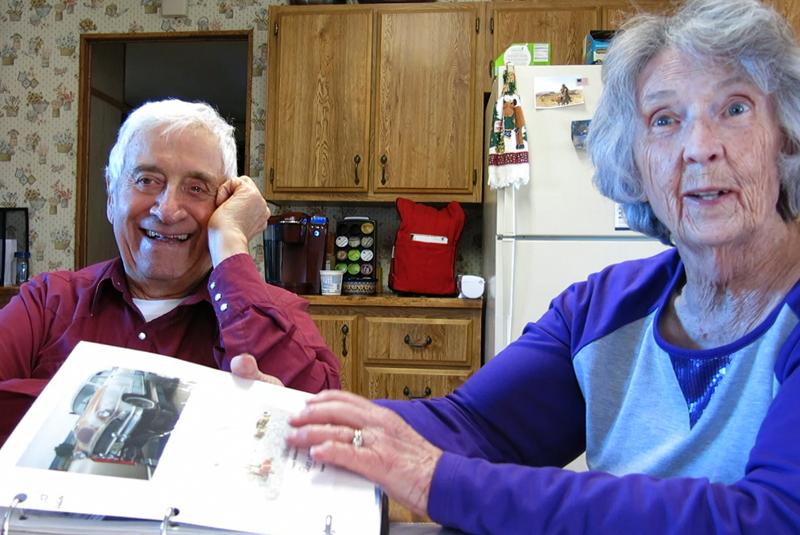 Wayne and Carrie Lou reminisce in Emery. A few weeks later, I drove with my 87-year-old mother to Emery, Utah for a short visit with Wayne and Carrie Lou. The four of us had a great time laughing, reminiscing, and recounting fun stories of times past. They shared some pictures from that time period that I had not seen. It was a great day, and in the evening we drove back to Salt Lake. Upon my return I transcribed the previous oral interview, added a few notes from the visit with Wayne and Carrie Lou, and bingo! I had the narrative for my book, which I had decided to title Five Hundred Miles on a Mule and a Case of Dynamite. In less than a weekend, Alison and I combined the text and pictures into a simple book, uploaded it to an online book tool, and my book was born. Here's the story of how I made friends with Cookie the mule. It’s not perfect. It’s not a worthy of a Pulitzer. But it recounts some fun times and left me flooded with warm memories. My next book will be about my mom and dad during WWII, before they met. It will contain a few stories that they have told me and maybe thirty pictures. It won’t be complete, comprehensive, nor even chronological, but it will be a means of saving some things that may otherwise be forgotten. What stories can you begin to discover, preserve, and share this week?